Album This song officially appears on the Another Day 7" Single. “Another Day” is a song recorded by Paul McCartney in New York in 1970, during the sessions for his album Ram. Although it was the first single of McCartney’s solo career, “Another Day” was actually written and previewed during The Beatles’ Let It Be Sessions in 1969. It was officially released on 19 February 1971 in the UK, with “Oh Woman, Oh Why” as the B-side. Neither song was included on the original pressings of Ram. “Another Day” is written in an observational style reminiscent of “Eleanor Rigby“; Denny Seiwell, the drummer from the Ram Sessions, called it “‘Eleanor Rigby’ in New York City.” The lyrics describe the drudgery and sadness of an unnamed woman’s life at work and at home. Paul’s wife, Linda McCartney, provided vocal harmonies on “Another Day“. Describing his and Linda’s distinctive harmonies, McCartney said “I wanted ‘our’ sound.” Paul was deliberately attempting to create a unique McCartney style, a musical identity outside of The Beatles. McCartney had decided to list Linda as co-writer of more than half the songs on Ram, and this decision extended to “Another Day.” Despite her lack of a musical pedigree, he insisted that Linda had been an active collaborator, making valuable suggestions about lyrics and melodies. Linda’s credits as co-writer were later regarded as business manoeuvres in the post-Beatles legal matters. 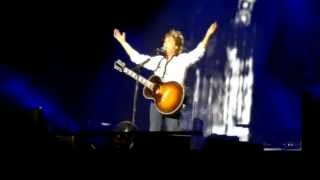 McCartney has played the song live several times over the years first on his 1993 World Tour and then for the first time in 20 years on his 2013 Out There Tour. According to drummer Denny Seiwell, the song was the first one taped during the RAM sessions in New York City at Columbia Studios. Basic track consisted of McCartney on acoustic guitar, Dave Spinozza on electric and Denny Seiwell on drums, with many overdubs added in subsequent sessions (bass, percussion, lots of other guitar parts). Although “Another Day” and “Oh Woman, Oh Why” were not originally included on Ram, some CD re-releases of Ram have one or both songs as bonus tracks. “Another Day” has also appeared on several of McCartney’s greatest hits albums, including All the Best!. It also appeared on the Wings greatest hits compilations Wings Greatest and Wingspan: Hits and History even though the song was not credited to Wings and predates the band’s formation. The single was re-released as part of Record Store Day 2012. It was included on the Special and Deluxe editions of the 2012 remaster of Ram. The song was included on an EP (along with “Oh Woman, Oh Why“, “Junk” and “Valentine Day“) released only in Mexico. This song is referenced in John Lennon‘s “How Do You Sleep?” in the line “The only thing you done was Yesterday, and since you’ve gone you’re just Another Day“. It was featured prominently in a 2009 episode of The Simpsons titled “Bart Gets a ‘Z'”, and has also been included in several films such as 50 First Dates (2004) and The Lovely Bones (2009). I like the idea of writing songs about ordinary people and day-to-day lives, and Another Day is one of them. We all get up in the morning and do our usual stuff, yet somehow – even through it all – there are often magic moments. We recorded it in New York with the help of Phil Ramone and it was a hit which, at that time, was especially pleasing. People gather 'round her and she finds it hard to stay alive. “Another Day” has been played in 132 concerts and 4 soundchecks.